When Dawn and I returned home after our Memorial Day Weekend boat-shopping trip (actually six days long, for me), we immediately threw ourselves into the not-inconsiderable task of packing up and moving our 2500 square-foot house into a 550 square-foot apartment 30 miles away. I had five days to commit to moving before taking off on an 11-day international work trip. They were a jam-packed five days, as detailed in the last post. Yet over the course of a few evenings, we did find the time to talk about the boats we had seen, decide which ones we were still interested in, and make a pros & cons list for each. We agreed that nothing said we had to buy one of these boats; if we waited longer, no doubt other interesting specimens would come along. And in fact I happened to have advance notice of a supposedly cherry Tayana 42CC (no teak decks!) coming on the market in the Tampa Bay area, and I didn't want to even consider putting in other offers before seeing it. Initially we decided there were five boats on our "interested" list: Oz, Windbird, Marathi, First Light, and Susurra. Of these, our pro-con exercise revealed a few too many insurmountable cons for Marathi, and too few pros for the price in the case of Oz, and so we struck them from our list. First Light had a lot of pros, one of which was that she had been extensively refitted and another was that I felt she could be had at a steep discount; her only real con was the prospect of a summer of gruntwork in a hot, dusty Florida boatyard before we could get her in the water. If I'd fallen in love with the boat I could have worked up the motivation to tackle that, but I was honestly kinda "meh" about her. She languished in third place. Susurra had a ton going for her and was probably the boat we most "fell in love" with...even though Dawn didn't see her, she was agog over the photos. But Susurra was expensive to begin with, and her inaccessible chainplates, worn-out standing rigging, and original engine meant that her post-refit cost was the highest of all the boats we considered by a good bit and at the very tip-top of our budget (and that assuming the owners bit on a rather lowball offer). We could afford her, but there wasn't a ton of cushion, and I suspected that if we bought her I would end up spending more time working to afford her than if we stayed more within our budget. That would mean less time cruising, in which case what's the point? The reality is that she was more boat than we need or even want. I would be reminded of that every time I docked her, hoisted her 80-pound anchor, scrubbed the bottom, or paid for insurance. She sure is a neat boat, though. And that left Windbird, the first boat I looked at and the one that managed to stay at the top of the list throughout our search. She actually looked better after having seen some other boats. She has the exact same needs as Susurra (chainplates, standing rigging, and high-time engine) but in all three areas the need for replacement isn't as acute, the refit would be less expensive, and she's far less expensive to begin with. She could use updated electronics but those are getting quite cheap these days and the thought of designing & putting together my own system appeals to my inner geek. As a cruising platform, she checks nearly all our boxes. She's what I consider the perfect size for a cruising couple with occasional guests. We can see ourselves living on her. She has an interesting history and has benefited from active, knowledgeable owners. And she's solidly within our budget. She was listed for $95,000 but based on Tayana comps I figured she would sell for about $85,000. My estimated refit (including engine replacement) would bring our cost up to $121,000. That's a good value for a well-equipped cruising boat. My main hesitation was honestly the teak decks. I like the look and feel of teak but it demands constant maintenance. The consequences of poor maintenance go well beyond crappy-looking decks; you risk water intrusion and core rot, with truly frightening repair costs. That said, it looked to me like the decks had received decent attention under the current owners' care. 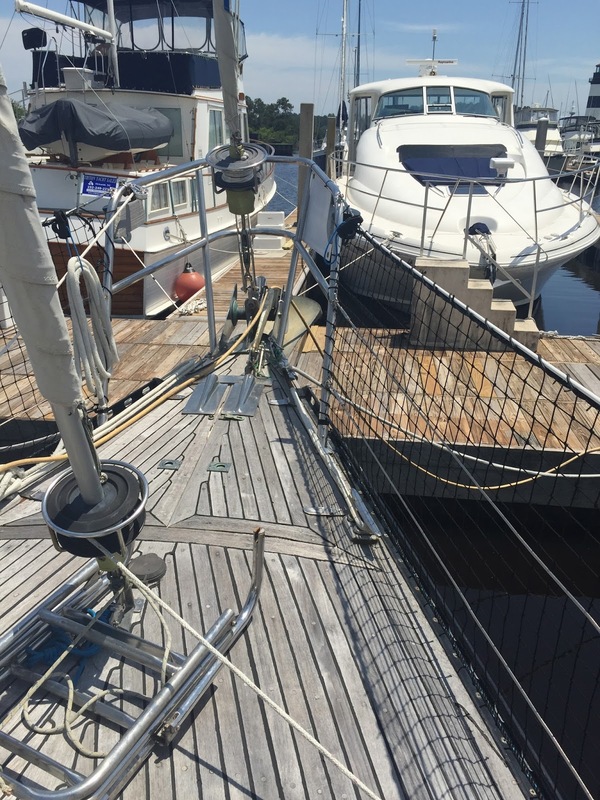 If we bought her, I figured there's a 50-50 chance we would have to replace the teak decks during our ownership (either by removing the teak and creating new fiberglass decks, or replacing the boards with fake teak), and that would run somewhere around $20k. It would also increase her resale value considerably. I dithered about putting an offer in on Windbird, which was easy to do as we were so busy with moving. Then I went on my trip and bounced back and forth between Salt Lake City and Paris, France several times. And then on my second Paris layover, during my nightly viewing of the new listings on Yachtworld, I came across the Tayana 42 that I had been tipped off about. She was listed at $139k, never had teak decks, and was quite nice, as I had been told - but she was not actually a center cockpit, she was the aft cockpit model. I sent Dawn the listing and she didn't like the layout that much. And reading further into the listing, I realized she would need some money put in her, almost as much as Windbird. So you'd be paying about $45k extra just for not having teak decks. I thought about it some more on the crossing back to Pittsburgh, talked to Dawn after I landed, and with her blessing decided that I'd made up my mind. I emailed an offer of $85,000 with several stipulations to John Schwab, Windbird's broker in Little River, SC. He responded that it seemed reasonable but I would need to complete an official offer form before he could present it to the owners, which took a little doing as Dawn and I both needed to sign & were in different states. But we had it submitted within a couple of hours, and very soon after that John responded that the owners viewed our offer very favorably and were accepting it without modification. 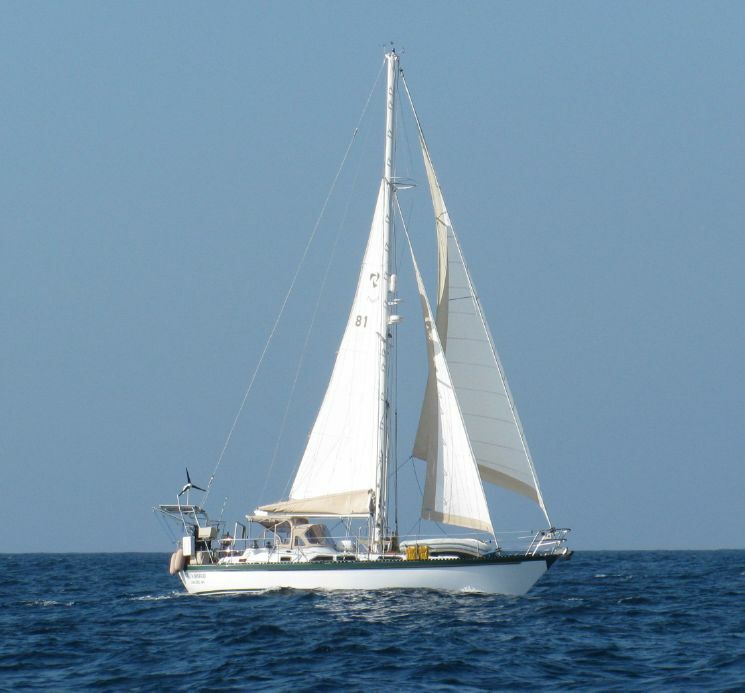 Subject to financing, survey, and sea trial, we will be the proud 4th owners of Windbird, a 1982 Tayana 42CC. Our house closed two weeks ago today - the time has flown by as I was on an 11-day international trip for much of that time since then (triple Paris layovers). We moved into our new, temporary one-bedroom apartment (all 550 square feet!) in downtown St. Paul the previous Saturday, June 4th. Well, actually it was more like Thursday through Monday, but we moved the big stuff via U-Haul truck on Saturday. On Thursday, Friday, and Saturday morning I filled up our Nissan Xterra with one load of boxes to our storage unit and one load of boxes to the apartment. We are on the sixth floor of the historic Pioneer building; the building is down to one elevator right now, making moving a challenge. You park curbside in a no-parking zone, unload everything to the curb, bring it all inside through two double doors, move the car to the parking garage, bring everything up to the sixth floor one elevator load at a time - waiting up to 10 minutes for the lone elevator - and then move it down the hall to the apartment. Quite the process. By comparison, moving the fewer pieces of bigger furniture was pretty easy, with Dawn's help. Even after that we still had quite a few things left in the house and garage, which we took care of on Sunday and then Monday morning. It's really amazing how much stuff a house will hold. We've only lived there five years, and lived in another one-bedroom apartment prior to that (having downsized from a 3-BR house once before). How did we accumulate all that junk? We actually sold or donated a large portion of it before moving, and it still seems like we have a ton of stuff. Very little of it is coming on the boat; some will go the storage unit, and for the rest I'm sure we'll have another round of winnowing before our next move in October or thereabouts. Because I had a 5pm report time on that Monday, I presigned for the closing in Chaska, and then Dawn attended the final closing in Plymouth the next morning. I never met the buyers but she reports they're a very nice young couple. Although I'm very excited to buy a boat and go cruising for the next few years, I do already miss our house and I'm sure I'll continue to miss it. It was a great place at the top of a hill with beautiful views of the surrounding countryside. It suited us well. Giving that up was a worthy sacrifice, I think, but a sacrifice nonetheless. I think Piper particularly misses the house - it's been a slow transition warming him to the apartment. He likes the apartment itself, but is extremely skittish outside with all the traffic, noise, and people. He hates being on a leash instead of being free to run as fast as his legs can carry him (which is pretty darn fast - he's a runner). At least there's a nearby dog park where he can run and socialize with other dogs, which he also loves and has adapted well to. I do worry a little about how he'll adapt to the boat, but he'll probably be fine - there have been many boat dogs before him. We'll just have to get him to the beach once or twice a day when we're not on passage to let him run his energy out a bit. Incidentally Piper and I are living the bachelor life at the moment as Dawn is on the west coast attending a one-week liveaboard sailing course in the beautiful San Juan Islands of Washington State. She reports that she's having a great time and it sounds like she's learning a ton; I'm sure she'll have a post about that when she returns. After dropping Dawn off at TPA, I drove the 3.5 hours up to Jacksonville, naturally enough ending up at a couple of nice marinas on the St. John’s River on the south side of downtown. One was locked down like Ft. Knox, but I was able to surreptitiously walk the docks at the other and even found a gorgeous Gulfstar 50 ketch for sale. A check on Yachtworld confirmed she was out of our price range. Early the next morning I picked up my friend Lance Yesdnil from the Jacksonville Airport; he had flown in from Seattle on a redeye to Atlanta. Lance and another friend of mine, Andy Peterson, used to own a Bristol 29.9 in which they cruised the Caribbean. Lance is quite knowledgeable about cruising boats and in particular the boat we were about to see, a Kelly Peterson 46. This one had been for sale on-again and off-again for a good four years and was currently on the hard in Green Cove Springs. It turned out that the owner and his wife were on hand, as well as the broker. That was great for answering specific questions. This particular KP46 had been on the hard in Grenada when Hurricane Ivan struck in 2004; of the 204 monohulls in the Spice Island yard at the time, 202 toppled over including Havana Goodtime. The hull flexed and destroyed a good portion of the port-side interior, which the owners had professionally rebuilt, but they chose not to repair the exterior gelcoat. Supposedly the hull was fine structurally and had surveyed out just fine, but I wasn’t so sure. It was a lot uglier than I expected, and looked like a recipe for water intrusion (maybe not as big of a deal on a solid fiberglass, uncored hull). There were several other places where Ivan had left its mark that had been unrepaired, and more recent damage that had been left as-is (like the gaping hole in the boom where an uncontrolled gybe had ripped out the boom vang three years ago). The KP46 is a great cruising boat, albeit a bit more than Dawn and I really need, and this one was as well equipped as most (including a dive compressor and tanks). But there were a lot of red flags of neglect. It looked like a pretty major project to me. The final straw was when I discovered a log entry from this January that said “headed north to Brunswick after a failed survey.” Earlier I had asked whether the boat had been surveyed since the Ivan damage and was told insurance only, and they all gave her a good bill of health. After seeing the log remark I asked the broker whether the boat had been under contract yet and was told it had but the sale fell apart, without specifying why. I didn’t press the issue. I have no desire to buy a boat from someone who’s not going to be open about its past. From Green Cove Springs it was three hours south to Fort Pierce, where we had an appointment to see another boat on the hard, this time in the gigantic, hardscrabble Riverside Marina boatyard. In contrast to the previous broker, I felt like Dave Schreiber was completely honest about First Light’s condition, strengths and weaknesses. 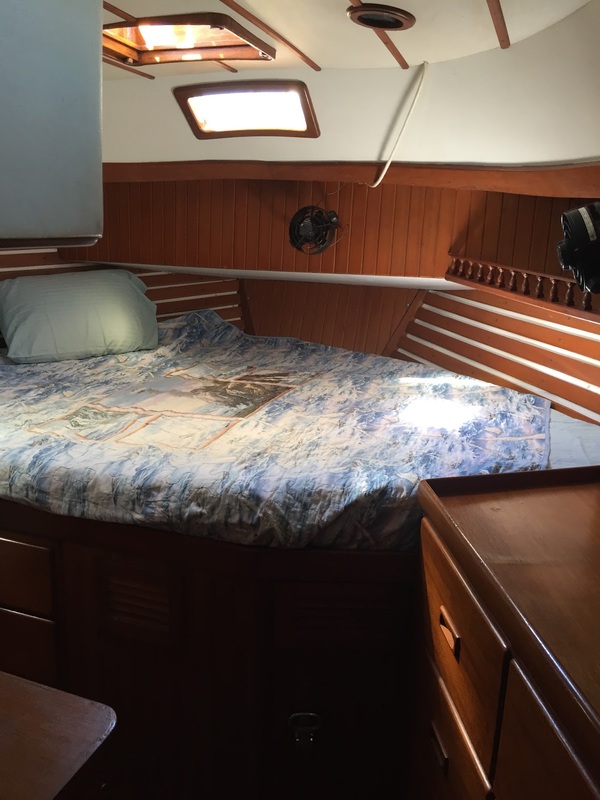 He is personal friends of the owners and had sailed on the 1981 Gulfstar 44 Sloop in the Bahamas several times, but the owners had since relocated and First Light had spent a year on the hard (though only for sale the last few months). When I saw her, I actually thought she looked better than Dave had described. Yes, she's ready for a bottom job, but there are no signs of blistering. The topsides are dirty with boatyard dust but otherwise in fine shape with good paint and nonskid and no soft spots. 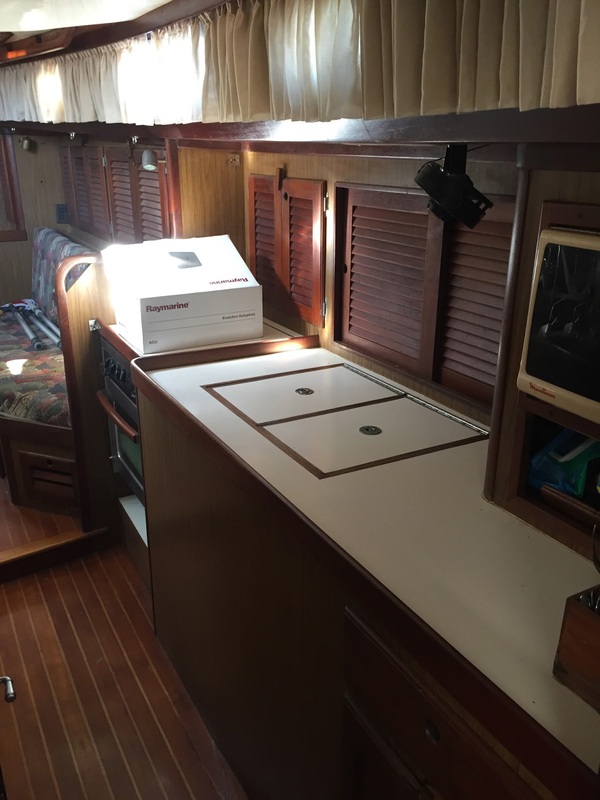 All the teak trim needs sanded and varnished, and the dodger/bimini vinyl is shot. 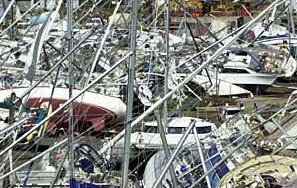 The standing rigging is ten years old and should be looked at closely, and the running rigging looks worn. But the chainplates have been replaced, the Yanmar engine is recent and low-time, the electronics are spectacular, and she has wind gen, solar, a genset, air con, and a watermaker. The interior is quite nice, not quite to the level of Oz but nicer than Radiance. She’s a project boat, but not a huge project. First Light is priced at $99,500 but I got the feeling she could be had for considerably less. She ended up being the best value on our list, which moved her into the Top 3. After leaving First Light we stopped by the new house of one of Lance’s cruiser friends; their Leopard 38 catamaran, Texas Two-Step, is actually parked right next to First Light (they just put it on the hard for hurricane season). We enjoyed talking to Leslie and ended up staying longer than we meant to, and so we got into Tampa quite late. It was a quick sleep and up early the next morning to make our 8am appointment in St. Petersburg. Lance was excited to see the Bristol 41.1, the big brother of his old boat. On paper it seemed decent but a little overpriced to me at $119k. It was at a boatyard having the electrical panel rewired, but was actually in the water. I thought the name was Calabar due to old pics on the Yachtworld listing, but it turns out her current name is Compass Rose – a funny coincidence as that was the old callsign at my former airline (which Lance now flies for). I ended up somewhat underwhelmed by Compass Rose. She was pretty nice on deck, but kinda mediocre below, seemed small for her size, and was missing a lot of items on our list. The forward head was pretty foul and the aft was small, with no separate shower stall (a big item on Dawn’s list). There were also several mickey-mouse installations that left me doubting the DIY abilities of her previous owners (the current owners are apparently more “leave it to the boatyard” types). 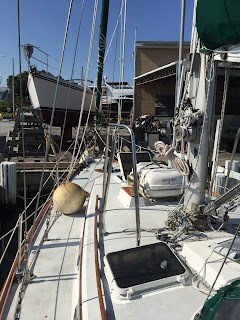 She has a cutter rig but it was clearly an aftermarket installation; the baby stay’s chainplate is very poorly attached to a rickety plywood divider in the chain locker, and there are no running backstays to prevent mast flex with the staysail in use. While the broker was absent, I asked the electrician who was rewiring the panel what he thought of the existing wiring. “There’s a lot of weird stuff in this boat, man!” he exclaimed. He should know. Originally Compass Rose was the last boat we were to have seen, but the previous night I had impulsively called on a 1985 Liberty 458 that was at the very top of our boat-buying budget. I hadn’t considered the Liberty among my list of potential boat types because it’s quite rare, but the design meets all our criteria and is actually based on the Kelly Peterson 46. From the moment I stepped aboard Susurra (Spanish for “whisper”), it was clear that this boat was a serious contender. The boat is absolutely perfectly laid out for cruising, and indeed feels much larger than 45 feet LOA. 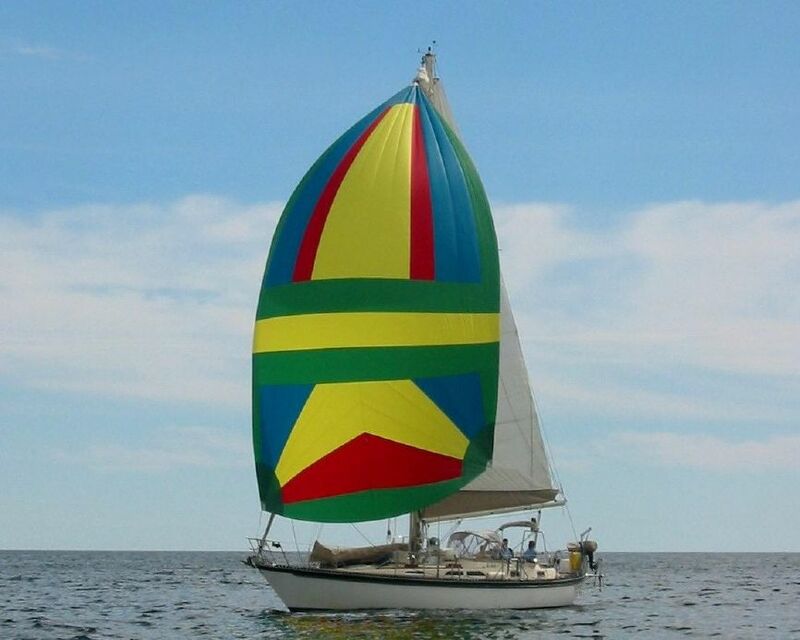 It includes: wind generator, solar panels, a stern arch with dinghy davits, a great enclosure, non-teak decks with good antiskid, tons of hatches, dorades and portholes for excellent ventilation, extremely sturdy anchoring tackle, a cutter rig, nice sailhandling equipment, recent electronics, a short/shallow companionway ladder that would be easy for Piper to negotiate, the most seaworthy galley I’ve seen to date, a stunning varnished teak interior with tons of room and stowage, a large, beautiful nav station, a spacious engine room, a workbench, an enormous aft cabin with a full-width queen berth with portholes on three sides, private aft head with separate shower stall, a unique combo office / Pullman double guest cabin with head forward, a genset, a high-capacity watermaker, icemaker, two AC units, and so forth. Wow! In terms of equipment, layout, and overall presentation, Susurra is the best boat we've seen to date (and thus, the most expensive). Even Lance, normally a big KP46 fan, was about to jump in and put an offer on her for himself! But for all the fireworks, there are some potential big-ticket maintenance items in Susurra’s near future. The engine is original and looks like it has seen better days (though external condition admittedly isn’t a great metric of an engine’s health). The stanchions and lifelines need replacing. The standing rigging appears pretty shot, and the chainplates are original and look it. This wouldn’t be a big deal except that they are extremely outboard and appeared to be imbedded inside the hull. The broker thought they could be accessed by removing joinery but the owner later confirmed they cannot be removed (or even inspected!) without grinding them out of the hull. What a stupid design! Other Liberty owners have had success relocating their new chainplates to the outside of the hull. This is a huge project that is well beyond my present abilities, and thus hugely expensive as well. These things, plus the fact that she’s really more boat than we need, kept Susurra from rocketing to the top of our list - but she made the Top 3 nevertheless. Our boat-viewing roadtrip encompassed 6 days, 3 flights, 1300 road miles, and 11 boats. I learned a lot over the course of the trip – most of all that any boat in our price range is going to need upgrading and repairs before heading out into the blue. It’s really a question of what things we want to pay for. As I flew back to Minnesota, I wasn’t 100% convinced that we had found our boat just yet, but I did have a list of five possible contenders for us to deliberate over: Windbird, First Light, Susurra, Oz, and Marathi. Since I was still in school, I didn't have much time to fly away to see sailboats like Sam, except for Memorial Day weekend. I had three days and was able to see 7 boats, four just on Saturday!! When we showed up to see both Oz and Radiance, I assumed that Radiance was the one to be more excited about. Once stepping onto Oz I was in awe. What a beautiful looking boat! But what do I know about boats?! I really liked the layout, except for the master cabin...I didn't so much enjoy the V-Bed. I really liked the galley and the saloon; I couldn't keep my eyes off them; they were staged so nicely. Oh, and the center cockpit was really nice too, with the teak floor and the nice cushions. After seeing both Oz and Radiance, I wish I had seen Radiance first. The other three boats I saw on Saturday all had to measure up to Oz in my eyes. During our time in the car, I studied my ASA course books, reading them aloud to Sam helped me understand the material better. In between chapters, we'd talk about the boats we saw; discussing pros and cons. My sailing course begins June 18th and I need to have three books read and study enough to pass my first written test before setting foot on board the sailboat. I wasn't too impressed with Haanli; she seemed much smaller than the other boats because of her layout down below. I didn't care for the curved settees around the table. But she had very nice teak in her saloon! By the time I saw Windbird, it was raining a little and I was tired. I felt bad because I didn't give her as much time as Sam did; however, he saw her before and was taking a closer look. I did like what I saw, I was just keeping an open mind and knew that I had planned to see two more (which ended up being three more) during the weekend. 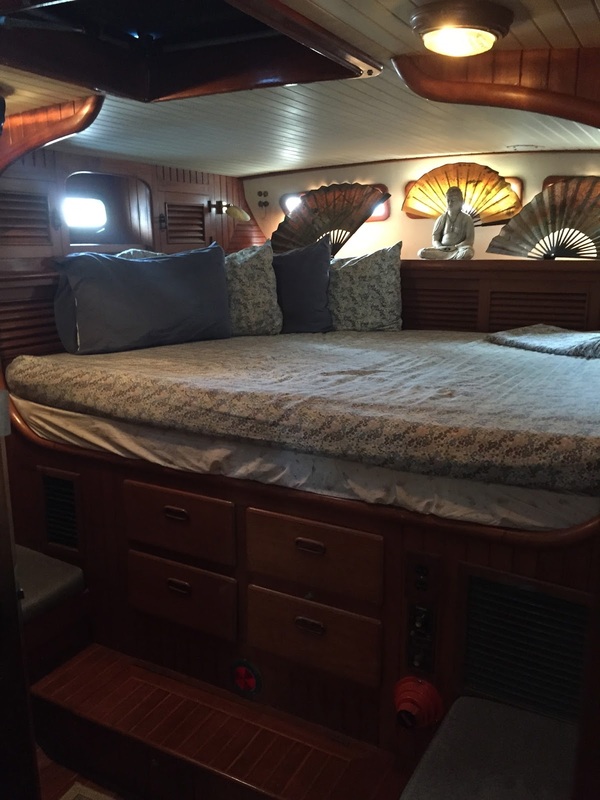 The couple who recently sailed her kept her in immaculate condition. All the teak in the center cockpit was well taken care of. The galley was tight, but according to Sam is best when under way. I liked the saloon and really appreciated ALL the storage all over the boat and in the captain's cabin...it's like having a dresser in the bedroom. I also really appreciate the separate shower in the captain's head. Up top was nice too. The center cockpit enclosure was nice but noticeably ready for new canvas...it's easy to see that it would keep us dry during rainy/stormy weather. Looking back, I wish I had spent more time looking her over. That evening, we had dinner with John, Windbird's broker, and his wife Beth. It was nice meeting and spending time with them because they have done some extensive sailing. Beth recommended a sailing cookbook The Boat Galley Cookbook, which I recently saw from one of my Pinterest pins. Upon saying good-bye, I hoped we would run into them again or could call upon them for some advice in the future. We only saw Archipelago to see how she compared to Windbird. Once aboard, I couldn't look past everything that would need to be updated...her most recent owner had neglected her. I tried my best to NOT look disgusted while looking around, because the owner and her friend were aboard. They said I could look anywhere, but I felt awkward looking in cupboards and such. I like seeing how and where people store different things. Since I've never lived aboard before, I want to get ideas of how I can store things on our sailboat. That afternoon, we had drinks with Sam's friend and his wife. We later drove south where Sam set up another boat viewing for Monday morning before I had to fly back. Overall, I can't say that I liked one boat over the other because they were all unique in their own way. I also needed to make sure I kept an open mind when discussing the boats with Sam because he had his list of needs/wants and I had my own. We needed to come to an agreement, which could take some time. I felt that Sam would be the one to make the ultimate decision on which boat would be best for us, but he wanted to make sure that I would be happy living aboard for two to three years. After a few weeks of discussing we finally came to an agreement...Sam will share shortly after he shares four other boats he saw during the next two days. I've never been a follower of people's blogs before because I didn't know where to start, but searching through Pinterest has forced me to read other peoples' blogs. I can spend hours looking through their blogs and pinning other ideas for myself. I hope to spend time reading through others' sailing blogs (especially this summer when I'm not teaching) to get me more excited about this new way of life. As I find sailing blogs, I'll be sure to share them here. Feel free to leave comments or suggestions for Pinterest Boards or blogs for me to follow - thank you! As I've become more excited about living on a sailboat, I've also created a board called Boat Clothes because I know that I may have to slightly change my wardrobe...fun, fun! After our long Saturday of boat shopping, Dawn and I drove partway back to Raleigh that night, then made our way to RDU the next morning to catch an 11:30am flight directly to Tampa, Florida. There we rented a car and headed across the bay to Clearwater, where we had an appointment to see a 1983 Brewer 12.8 named Marathi. I've covered some of the Brewer 12.8 history in a previous post, talking about how a syndicate of 10 Whitby 42 owners approached Ted Brewer to do a redesign on the Whitby to create the ultimate cruising boat. Well, Marathi was actually one of those original, identical syndicate boats; she was hull #6. Since then she'd had several owners, the most recent of which had made significant improvements. On paper, she looked like the best deal on our list at $115,000: repowered with a recent Yanmar, a generator, solar, wind, SSB, decent electronics, dinghy davits with stern arch, hard bimini with full enclosure, recently replaced standing rigging including chainplates, newer sails, a good anchoring package! She was loaded! And in the Yachtworld listing, she looked fairly sharp. The broker did caution me that she was cosmetically challenged but said the owner was catching up on the cosmetic work and her bones were good. She would soon be getting a new bottom job, and a repair to her centerboard that was stuck in the "up" position, he said. When we saw her in person, my overall impression was of a somewhat dull, dingy boat that hadn't received much love in a couple of years. Yeah, the "gee whiz" stuff was all there, and the engine room was a thing of beauty. The owner was an electrical engineer by trade and it was clear where he had put his natural talents to use, but he was also quite old, hadn't used the boat much in years, and the neglect really showed despite fresh coats of varnish on some surfaces down below. She smelled more like "old boat" than most old boats (a tantalizing mixture of mildew, diesel, and head stink). The portlights were crazed over and had signs of water damage below them, as there was below the original hatches. The overall quality of the interior joinery looked very cheap, the galley in particular was unimpressive, and Dawn noted that the master head lacked a separate shower stall. Back on deck, we found the paint to be old and peeling, without a lick of antiskid remaining. 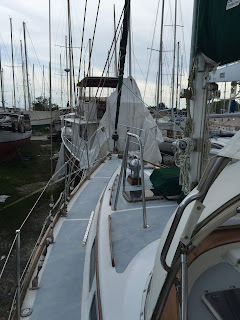 The coup d'grace was when Dawn discovered several soft spots on the foredeck, indicating areas of probable water intrusion and core rot. 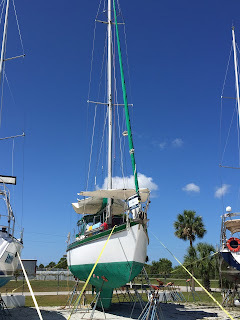 The broker professed to not know about that and said the owner would get right to fixing it (along with the new bottom paint and centerboard fix, I guess). Maybe he will...that's a huge, open-ended job. In any case, we were sorely disappointed with Marathi, a boat that held such promise. We initially struck it from our list, but later added it back on and even moved it onto the top five list under some fantasy of a lowball offer that stipulated deck repair and new hull paint, after which we'd put a bunch of money mostly into cosmetics. But we really had little enthusiasm for it. I made the comment that it felt like a boat you'd go camping on rather than a boat you'd live on, and Dawn thoroughly agreed. There was no disappointment involved with the next boat we looked at, because our expectations were low to begin with. [Rest of comments redacted by request of owner - Tayana 42 that needed a lot of work]. After meeting some local friends for drinks at a rooftop bar in downtown St Pete (overlooking a pretty yacht basin where some really nice cruising sailboats were moored), Dawn and I were deciding where to spend the night when I decided to call on another 1981 Tayana 42CC that had recently been listed. This turned out to be the broker's personal boat - her name, Sea Schell, is a play on his last name. 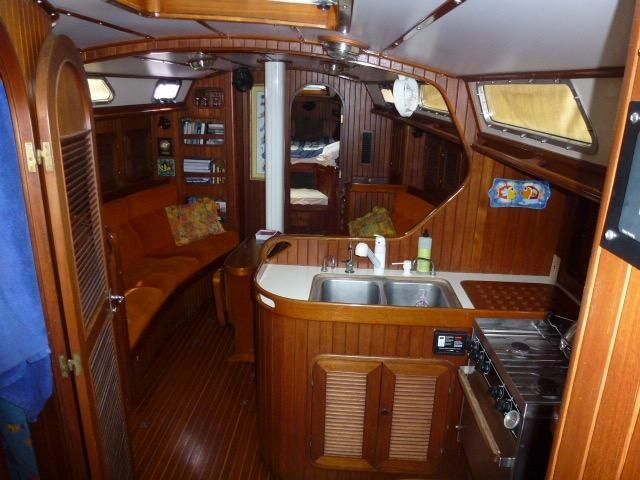 The owner and his wife had purchased the boat for a one-year Caribbean interlude, and ended up staying for 13 years. It was located 100 miles south of St. Pete, down in Port Charlotte...but hey, we had come to look at sailboats, so why not! I set up an appointment for the following morning and we ended up spending the night at a hotel about 10 miles from the boat. The boat was out of the water and on the hard in a working boatyard for the approach of hurricane season. Naturally, boats never show very well in this setting, but it is nice to be able to see the whole hull. Sea Schell is about due for a bottom job but the hull is otherwise in decent condition with no blistering. Topsides and below, the boat actually showed better than its yachtworld listing, I thought. The teak decks need some attention, though they're not as bad as Archipelago's. The boat isn't quite as well set up for cruising as Windbird - the staysail is a hank-on type, there's no solar power, no dinghy davits; actually, no dinghy or outboard either as they're not included in the sale. Below was yet another iteration of the Tayana interior; we actually didn't care for this one so much as it featured twin captains chairs to port instead of a settee; there's no usable sea berth and it limits seating around the table. The aft cabin featured an athwartships king instead of the offset queens we'd seen on the two other Tayanas. The galley seemed less secure due to the angled sink. Overall, though, Sea Schell showed pretty nice below, especially the 2010 repowered engine and mechanical systems. The owner did a really nice job with planning & installation; everything was easily accessible, neatly wired, and clearly labled. At $85k list price and minus a dinghy and outboard, Sea Schell wasn't priced much under Windbird and lacked some of Windbird's cruising equipment. Windbird generally showed better, other than the engine room where Sea Schell was exceptional. Sea Schell has a more recent repower with much lower engine hours than Windbird. The main problem is that she's a boat that's really set up to use the engine for power generation: there's no solar, the refrigeration uses an engine-driven cold plate, and the high-capacity watermaker is engine-driven. The owner reported running the engine around three hours a day in the tropics for refrigeration alone. To me, sailing to a peaceful anchorage and then sitting there with the engine clattering completely defeats the purpose of a sailboat. You could change out the refrigeration, add a solar array, and only use the engine for watermaking while topping off the batteries, but this would be a bit expensive. The thing you couldn't easily change is the interior configuration of the salon and galley, which Dawn really disliked. All these factors combined kept Sea Schell off the top 5 list, though I thought the side trip to Port Charlotte was well worthwhile. Saloon had two captains chairs. One swiveled to NavStation. Next up: Kelly Peterson 46 "Havana Goodtime"...Gulfstar 44 "First Light" ...Bristol 41.1 "Compass Rose" ...and Liberty 458 "Susurra." 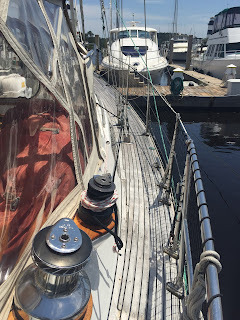 Our first day of boat shopping continued with a two-hour drive from New Bern, NC to Southport, NC, where we met broker John Schwab of Triton Yachts and his wife Beth. 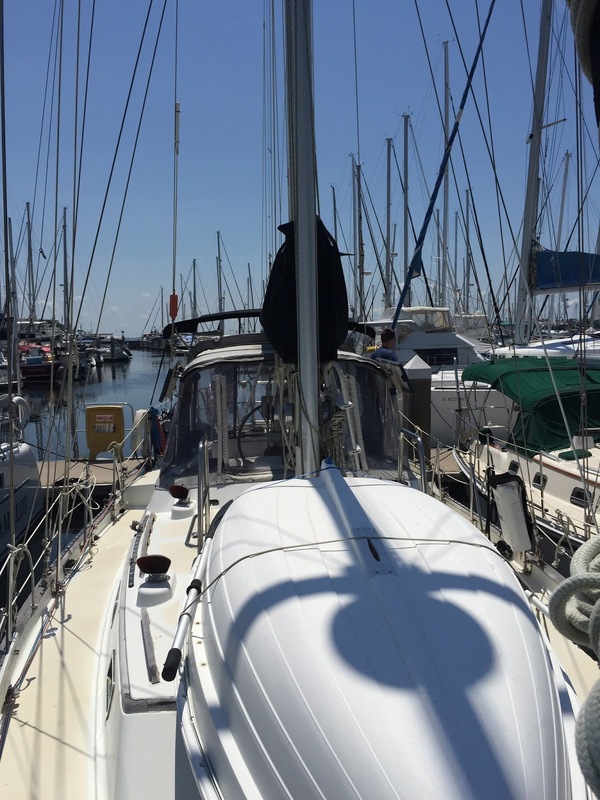 I had met John a few weeks previously when I flew into Myrtle Beach to view a Tayana 42 named Windbird, and at that time he suggested we also take a look at a Tatoosh 42 an hour up the coast in Southport. The location and timing worked out for both the Schwabs and Dawn and I, so I set up an appointment to see "Haanli," a 1983 Tatoosh 42. The Tatoosh is a stout Robert Perry design that is recognized as a good offshore cruiser, but it is an aft-cockpit boat, which is why we hadn't considered it originally. But as I've noted, actually being onboard a sailboat is an entirely different experience than viewing photos online, and so we agreed that we should actually get on an aft-cockpit cutter before ruling them out. The Tatoosh is a fairly rare boat but has much in common with similar and more popular Perry designs such as the Valiant 40, Passport 40/42, and Baba 40. If we liked this one, we might've expanded our search to include those boats as well. As it turned out, our initial instincts were correct; the design simply wasn't what we're looking for. Haanli showed very nice and has obviously been taken care of, and we liked the cockpit, salon, and galley, but the staterooms were both fairly small and not terribly private, similar to what we're used to on charter boats but not what we're looking for in a boat to live on. If it was just the two of us (three including Piper), that'd be one thing, but we're planning to have frequent guests staying aboard with us. That, plus the fact that Haanli wasn't really ideally set up for "off the grid" cruising and would need some upgrading, made us cross her off the list soon after we saw her. We subsequently continued an hour south to Little River, SC, which is just across the state line and slightly north of Myrtle Beach. This is where John and Beth live, and also where Windbird is currently docked. As mentioned, I had already seen this Tayana 42, and it was in fact the very first boat I saw. Having subsequently seen three boats in Seattle plus three boats already on our roadtrip, I had picked up a few more things that I wanted to look for, and I wanted Dawn to see the boat as it was presently at the top of "the list." Windbird is a 1982 Tayana 42 Center Cockpit Cutter. She's had three owners; her current owners, Mark & Judy Handley, bought her in 2001. 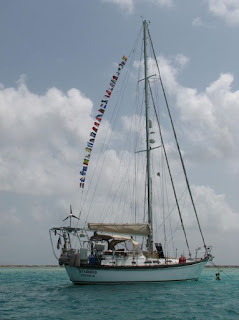 They refitted her, started living aboard in 2003, and in 2005 took off on a 6-year, 39,000-mile circumnavigation which Judy blogged on a nearly nightly basis - her account is one of the better cruising blogs I've read, but it's a long read! After their return, they continued to live aboard and extensively cruised the east coast & Bahamas. So this is a boat that has been very well used, but also very well maintained and upgraded by obviously knowledgeable owners. 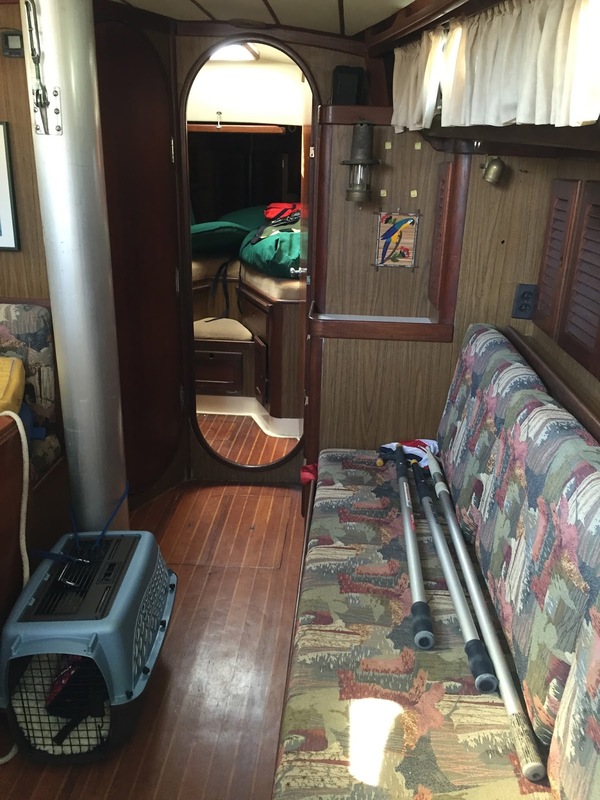 Sadly, Mark has been battling cancer & the Handleys had to move ashore in Massachusetts for his treatment, which is why the boat is for sale. Windbird checks many of our boxes. She's a cutter-rigged center cockpit boat, of a notably rugged and seakindly Robert Harris design that has many circumnavigations under its belt. 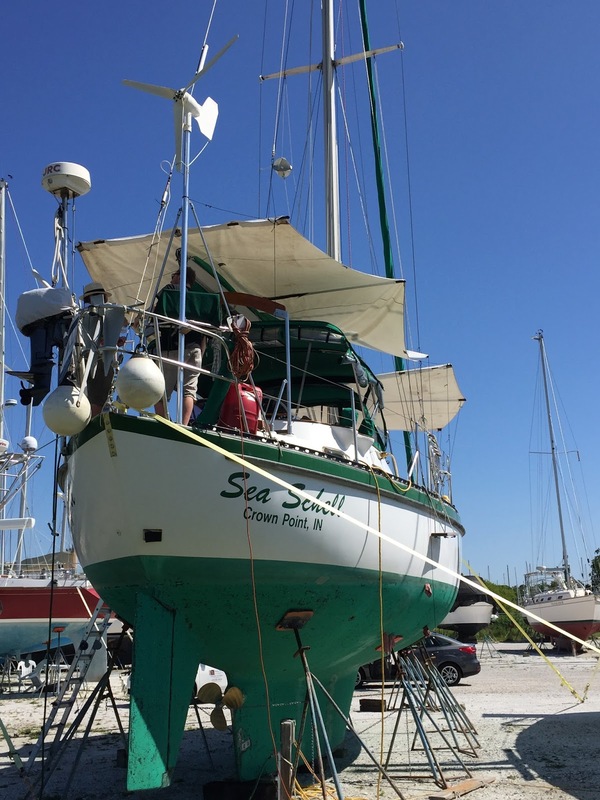 She's very well set up on deck, with a full enclosure, well thought out sail-handling and anchoring systems, upgraded standing rigging, and a big, beefy dinghy davit arch that also supports solar panels and a wind generator. 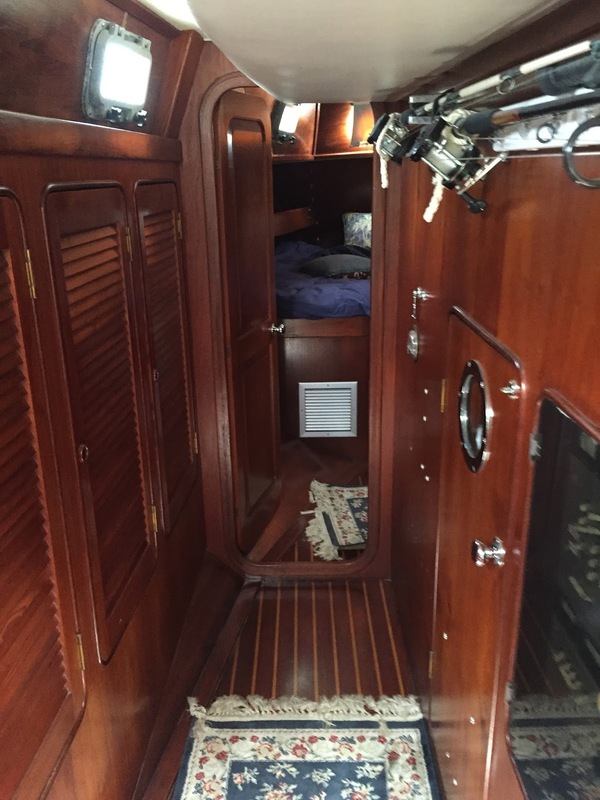 Below she's got a gorgeous teak interior, a very private aft stateroom with a ton of stowage, private aft head with separate shower, a seaworthy galley, decent ventilation with four hatches and six dorade vents, dockside air conditioning, and a watermaker. She's been repowered with a 53hp Yanmar, was barrier coated in 2002, and has a new bottom job. She comes with a nice RIB dinghy and nearly bulletproof 15hp Yamaha 2-stroke outboard. That said, much of Windbird's upgrading was done before the circumnavigation and has a lot of sea miles on it. So the 2003 upper standing rigging is likely due for replacement (2011 lowers are probably still good), some of the sails may be a bit bagged out, the 2009 cockpit enclosure canvas is definitely at the end of its useful life, and so forth. The chainplates are original and are showing some surface rust that may or may not be a sign of crevice corrosion further below, and should probably be replaced in any case. The Handleys used a laptop-based navigation system with a repeater monitor in the cockpit, and while it worked for them, I would probably upgrade to modern electronics. That 2005 Yanmar now has an incredible 7900 hours on it, which initially put me off. I've since talked to quite a few people who say a marine diesel should easily go 10k+ hours before overhaul with proper maintenance...but the reality is that one way or another, we would have to budget for an overhaul or repower, because the engine will have nearly 10k hours on it when we go to sell the boat. The other downside to Windbird is that she has a lot of teak - acres, practically. Varnishing teak trim was another constant theme to Judy's blog, and her care shows on the caprail, dorade boxes, etc. 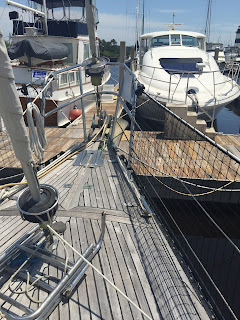 The decks have been allowed to silver, which doesn't look quite so good as blonde teak but is far less maintenance-intensive and also longer lasting (no sanding, occasional saltwater bath with detergent). The deck was completely rescrewed and rebedded a few years ago and has been well-maintained since, so it's in pretty good condition with no warped boards, good caulking, and very few popped bungs over the screws. Even so, there's no question that a teak deck will involve much more maintenance than a fiberglass one, and it has the additional downside of being rather hot underfoot at midday in the tropics. On the plus side, teak provides excellent traction when wet (which is why it was used in the first place), and I personally like the look. I thought Windbird showed better now that I've seen a few boats, and Dawn liked her a lot, almost as much as Oz. The marina she's in is liveaboard-friendly and dockage cost is really reasonable; the slip transfers with the yacht. There are a decent number of marine service providers in the area to help with the refit before we take off. These are all secondary considerations, of course; the primary ones are whether the boat is one that meets our needs, whether we can see ourselves living on her, and whether she represents a good value. Windbird definitely meets the first two criteria. As for the third, it depends. Windbird is currently listed at $95k, significantly below most other boats we've looked at, but my "apples to apples" theoretical refit is estimated at $39k. There were a few boats we'd be looking at in Florida in the next few days that seemed to be better values with less refitting required - on paper, anyways. For the time being, though, as we left Little River, Windbird remained at the top of our list. 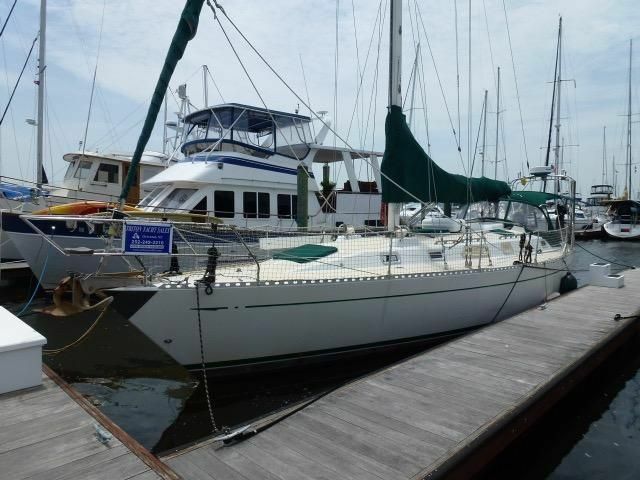 Just down the dock from Oz was another Gulfstar 44, this one a 1984 model, listed by the same broker and priced slightly higher at $129,900. There were a few similarities: both had behind-the-mast roller furling (which I'm not a huge fan of, but is at least better than in-mast roller furling), recent, nicely done cockpit enclosures, dinghy davits, updated galleys, and similar layouts. Like Oz, Radiance has her original Perkins 4-154 engine. But like most Gulfstar 44s, Radiance is a sloop rather than a cutter like Oz - not a deal breaker, persay, but many experienced cruisers prefer a cutter rig for offshore work as it gives you more sailplan options to keep sailing & maintain steerageway in higher winds. Radiance isn't set up for wind or solar, which is our preference, but unlike Oz does have a genset, watermaker, and SSB. The electronics were mostly updated, and owner recently added an expensive bow thruster. Some but not all of her standing rigging has been updated; the chainplates are original. But whereas Oz showed really well cosmetically, Radiance had a somewhat worn look to her both topsides and below - you couldn't really tell this in the Yachtworld photos, but it was apparent in person. 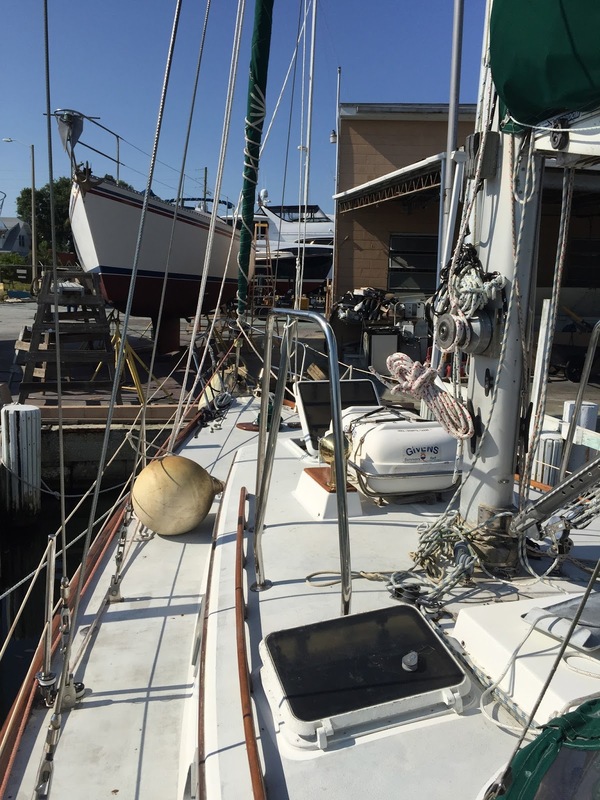 The reality is that cosmetics are about the cheapest thing to upgrade on any sailboat - it's mostly elbow grease. Only the deck paint and nonskid would cost much at all to refresh. But as new sailboat shoppers we found it difficult to look past the lack of spit & polish. I think Radiance suffered for having been shown immediately after Oz, and now that we've seen a couple of truly rough boats I think Radiance would show better. That wouldn't change the fact that she's one of the higher-priced boats on our list, would still require some refitting and budgeting for an eventual repower, and even then would still be a sloop with diesel-dependent systems. She wasn't a bad boat, but she wasn't a great value in my mind, and Dawn didn't like her nearly as much as Oz. Visiting Oz and Radiance together did have one big effect on our boat search. 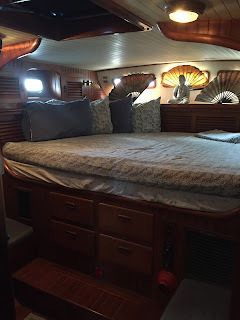 Prior to seeing the boats, Dawn thought she would really like a centerline walkaround queen master berth as opposed to athwartships, offset, or V- or U-with-inset berths. It seemed more like our bed on land, I suppose. Boats with centerline queens aren't extremely common (except on Hunters, Morgans etc) and the feature usually carries a bit of a premium, but with Dawn's preferences in mind I'd been looking out for them. When she saw Radiance's centerline queen in person, though, Dawn wasn't impressed. She thought it seemed insecure compared to the full-beam U-berth on Oz, and she was right. You certainly couldn't use it on passage, and even in a rolly anchorage you'd be fighting to keep from sliding out of bed (I suppose you could rig up some lee cloths but that's kinda negating the whole point of a walkaround centerline queen). So that's one item that's been eliminated from "the wish list." It's one thing to peruse listings on yachtworld, and another entirely to see a boat in person. Next up: something completely different, the Robert Perry-designed 1983 Tatoosh 42 "Haanli." I was originally planning to post about the individual boats we're interested in before our east coast road trip over Memorial Day weekend, but house sale & moving stuff got in the way and then it was a very busy trip (11 yachts, 6 days, 3 states, 3 flights, 1365 driving miles!). Instead I'm going to write individual posts about each boat that we saw. Dawn may also edit a few of these posts to add her thoughts. We flew into Raleigh-Durham late Friday night, rented a car, and drive a half-hour southeast to Clayton for the night. 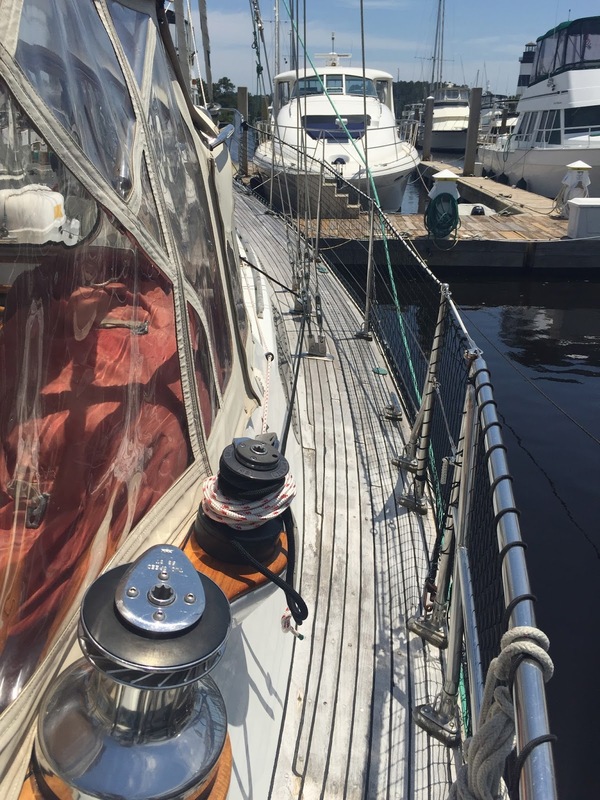 We were up early the next morning to drive to New Bern, where we had an appointment to look at two different Gulfstar 44s, both listed with the same broker within a few days of each other. They had both been on the market for less than a month. Oz was the slightly older (1981) and lower priced of the two at $124,900, and also seemed to be less well-equipped for cruising as she lacked a diesel generator, wind generator, watermaker, and single sideband (SSB) high-frequency radio. On her Yachtworld listing, Oz looked cosmetically about the same as the other Gulfstar ("Radiance"). This turned out to not be the case at all. Walking up to Oz, she made a really nice first impression. The topsides and deck paint was fresh, the teak rubrail, toerail, and cockpit combings were well varnished, there was a nice radar arch with dinghy davits and a solar panel (with two more on the bimini), there was a beautifully done full cockpit enclosure with roll-up issenglass curtains, and the running rigging for the cutter sailplan was nicely laid out. Below, the impression of care and taste continued. A lot of this was cosmetic, but looking under the floorboards and in the engine room it was clear that the standard of care included mechanical systems as well. The broker had also done a nice job of staging the vessel, and it ended up being one of Dawn's favorites of the trip. 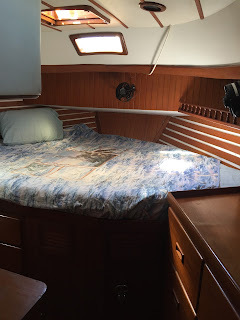 She liked the room and stowage in the aft stateroom and the way that the galley extended a little ways aft of the companionway to provide extra counter space while still being narrow enough to be secure in a seaway. Before the trip, Dawn indicated a strong preference for a walkaround queen berth in the aft cabin, but ended up liking Oz's "romper room style" king with insert. 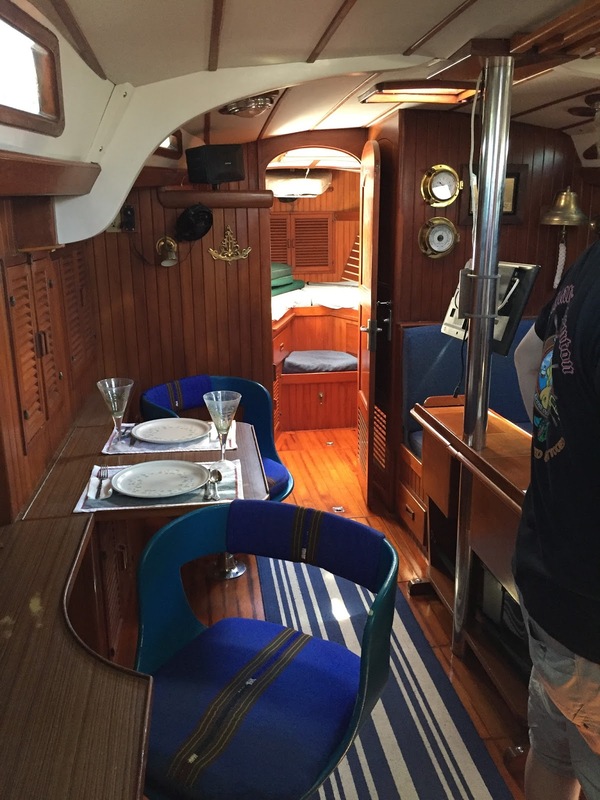 The overall layout of the Gulfstar 44s is really livable and this one in particular was very homey. The downside was that Oz had her original Perkins engine as well as her original standing rigging and chainplates. Mind you, marine diesels are tough engines that will run a long time with the proper care, but there's no denying that an engine with thirty-year old gaskets and seals is going to have to be overhauled at some point, if not replaced outright. Meanwhile the standing rigging looked fairly decent, which is attributable to the fact that the boat spend the first 20 years of its life in freshwater, but it had now been in saltwater long enough that prudence dictated replacing the standing rigging and chainplates before starting a long cruise. This plus the need for upgraded electrical system components and cruising equipment would make for a very expensive refit; even with a good discount off asking price, Oz would be toward the top of our budget. Still, she made a strong enough impression to make the "Top 5" list, while her theoretically better-equipped sister ship for sale just down the dock did not. 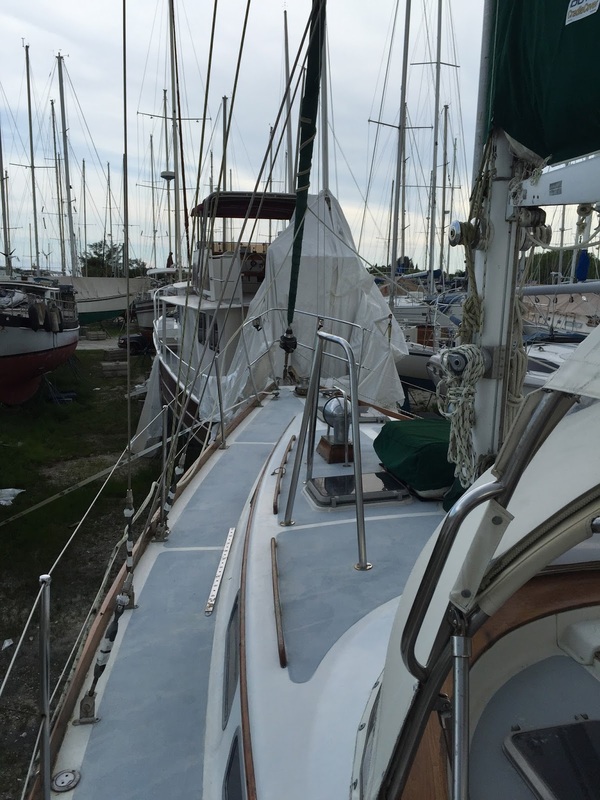 Next up...Radiance, a 1984 Gulfstar 44 Sloop.